Toyota FJ Cruiser Forum > Toyota FJ Cruiser Discussion > Suspension / Steering Tech > The NEW Complete Lift Listing and Comparison, They're All Here! UPDATED! The NEW Complete Lift Listing and Comparison, They're All Here! UPDATED! Price: Front Long Travel Kit: $2,698 ; LT Coilovers: $1,595-$1,895 ; Rear Kits: $479-$839 ; Solid Axle Swap: 8,979 Appx. Front Suspension Details: All-Pro offers several front suspension items including their popular long travel kit which includes both upper and lower control arms made from 4130 chromoly tubing which add +2” of track width per side, extended brake lines, heavy-duty spindle gussets which require welding, and tie rod extensions. The kit requires long travel coilovers, and All-Pro offers some from Fox, but they used to offer a coilover adapter so you can use your normal coilovers with the kit until you decide to swap them out for LT ones which add an extra inch of travel. Other kit options which are suggested or are required include their heavy-duty steering kit, chromoly extended axle shafts, and Timbren bumpstops. 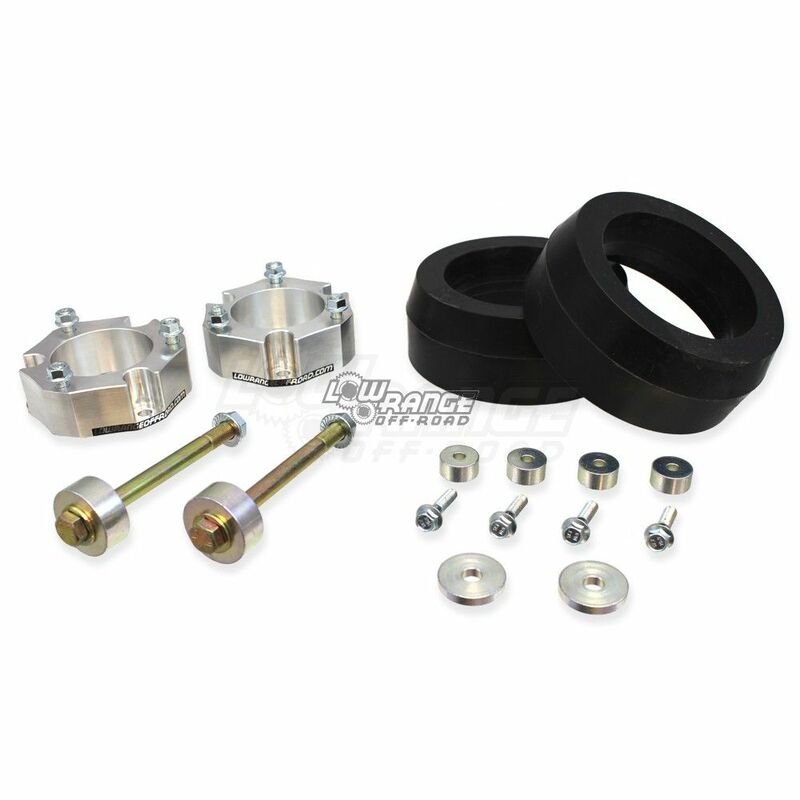 Other All-Pro items available for individual purchase include their weld-on spindle gussets, upgraded sway bar links, sway bar collars, bumpstops, and long travel outer C.V. boots. One popular item from All-Pro is their stock length 4130 Chromoly Upper A-Arms which has a 1.25” uni-ball and zerk fittings for easy lubrication. Rear Suspension Details: All-Pro’s rear suspension components include Fox shocks in 2.0 and 2.5 variations with or without adjustable reservoirs and their AntiRock sway bar kit, which requires some welding and minor trimming. They used to also offer rear coils in 2" and 3.5" variations as well as rear links. Solid Axle Swap: All Pro offers many of the components required for a solid axle replacement if you wish to say goodbye to your independent front suspension. For approximately $9,000 one can get all the parts necessary to do the swap, but obviously labor costs would be extensive and much welding, trimming, and cutting would be necessary. Details: Provides 3" of lift, recommended tire size is 285/70R17. 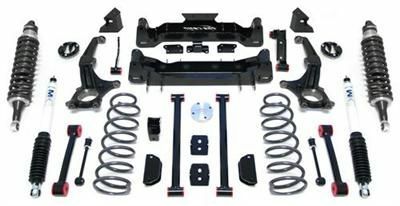 Front suspension of this kit uses a combination top mounted strut spacer along with a preload spacer to lift the vehicle and retain the factory geometry. The rear of this kit replaces the factory coil springs with 2" BDS ProRide coil springs to level the stance and comes with NX² series shocks that retain the ride quality and allow full articulation of the rear suspension. Rear sway bar links are also replaced with longer ones to allow the sway bar to operate in its ideal position with the lift installed. Details: While Bilstein is the producer of high quality shocks and coils they do not advertise their suspension in "kit" form or even as individual products for purchase on their websites. The only way to obtain Bilstein shocks or a Bilstein lift is through dealers such as ToyTec, PureFJCruiser, etc. Sonoran Steel Fabrication for example uses Bilstein shocks and coils in their lift package, as do some lifts offered by ToyTec, and others can surely be listed. Some of the products offered through dealers will already be pre-assembled, and from some dealers they come disassembled. The most popular shock by Bilstein used on FJ Cruisers for lifted applications is their 5100 Series shock, which is height adjustable for the front suspension depending on how you mount the coil with the notched mounting plate (most using the "3rd notch" to achieve a 3" lift). However ToyTec offers adjustable coilovers that feature Bilstein 5100s making adjusting easier and more precise. More recently though some have started using Bilstein's newer, larger 6112 Series and 5160 Series shocks for increased performance. The 6112 has a larger diameter therefore increasing dampening power and would be used on the front suspension. The 6112s are also height adjustable like the 5100s. And the 5160s are for rear suspension applications and feature an external reservoir. Another noteworthy thing to add is that Bilstein suspension is what is found on the FJ Cruiser from the factory and then the Special Edition FJ Cruisers feature specifically tuned Bilsteins for more off-road based applications. The 2007 TRD Special Edition FJ Cruiser featured TRD Bilstein "off-road tuned" shocks giving it an edge over the base model FJs. And the 2008 & 2010-2013 Trail Teams Special Edition FJ Cruisers have "trail-tuned" Bilsteins which are often referred to as "TT Bilsteins," the "TT" either standing for Trail Teams or trail-tuned. 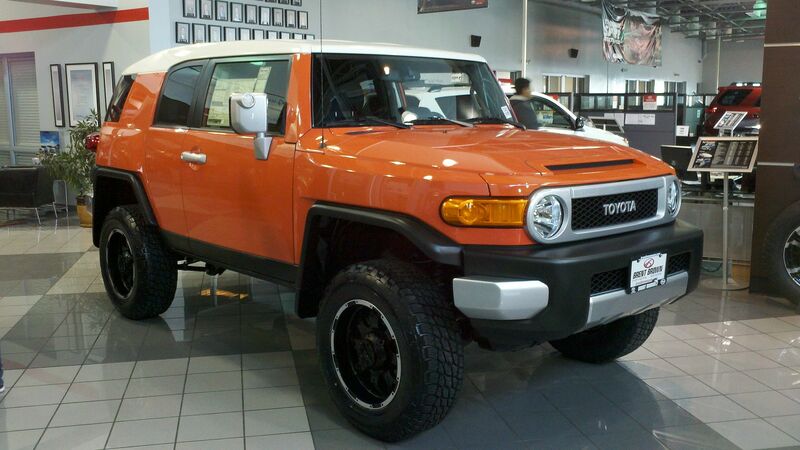 The 2014 Trail Teams Ultimate Edition FJ Cruiser however got an extra special treatment from TRD and Bilstein. It received "TRD-tuned" Bilstein shocks in the front and rear, specifically with the 5160 Series in the rear with the external reservoirs and with special, red TRD coils in the front which had additional height to them as to allow the TTUE to have a leveled stance. 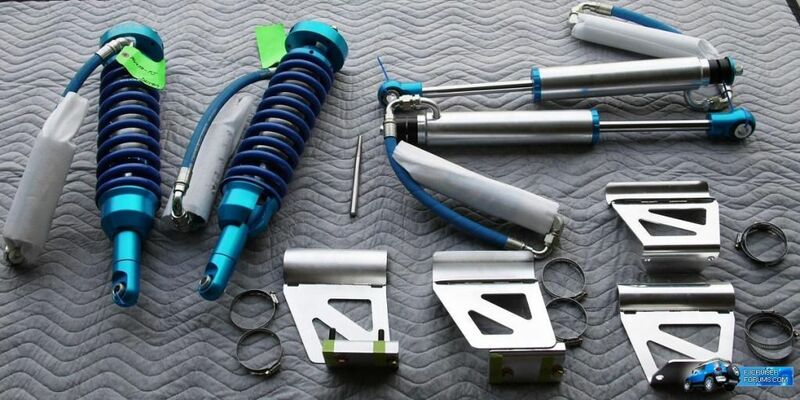 Type: Coilover sets, long travel kits, standard lift kits, and other suspension accessories. Details: Camburg offers standard and long travel suspension kits and also offers individual suspension components for purchase. 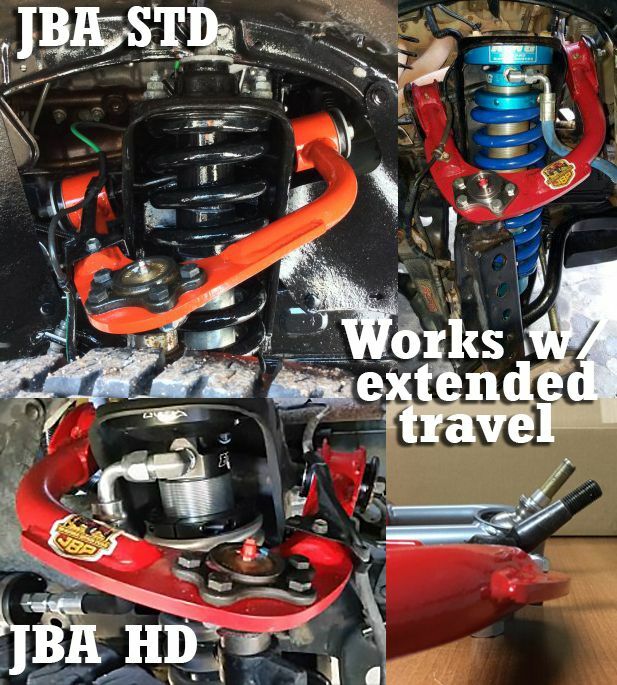 Their long travel system will yield up to 15″ travel on a 2WD FJ and 14″ on a 4WD FJ and can be upgraded by adding an additional 3-tube bypass shock. Long travel 2.5" diameter coilovers from FOX, King, or Sway-Away can be purchased with the kit and the LT kit includes Upper Uni-ball A-arms, Lower Uni-ball A-arms, Lower Uni-ball Spindle Adapter, Brake Lines, Limit Straps, Steering Extensions, and Coilover Mounts. Camburg's Bilstein Entry Level Kit has Bilstein 5100 front & rear shocks along with Camburg's ball-joint UCAs (these can be upgraded to 1.25" uni-ball UCAs). Front and rear coil springs will need to be added which are sold separately. Camburg also has their Factory Fox 2.5" Kit which features FOX 2.5 Factory Series R/R Coilovers for the front and FOX 2.0" Performance Series Rear Shocks for the rear suspension. This kit also includes Camburg's 1.25" uni-ball UCAs and for these kits, the recommended tire size is a 285/75R16 or 285/70R17. 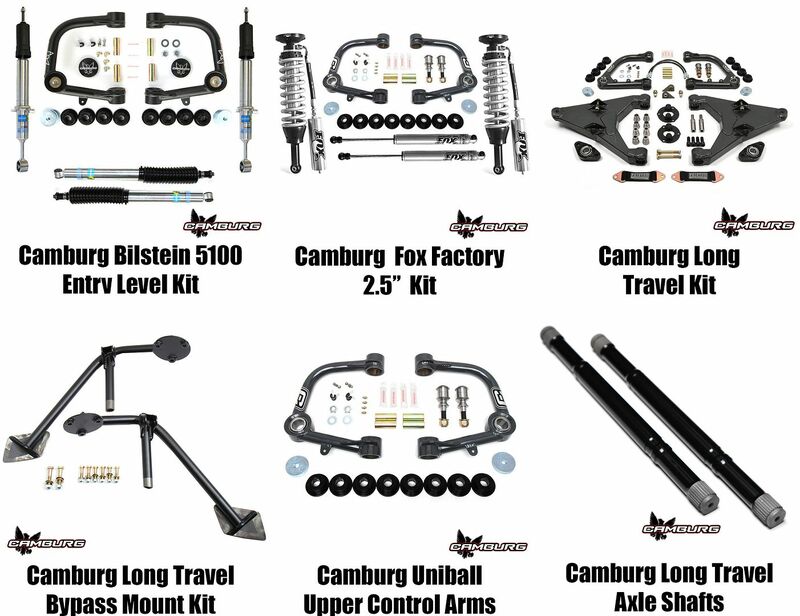 Notes: Other items from Camburg available for purchase individually include their 1.25 Performance Uni-ball Arms, UCA ball-joint cover, limiting straps and clevis, long travel axle shafts, and Camburg/Wheelers rear coils, King coilovers, and Fox coilovers. Kit Details: Daystar offers polyurethane spacers that provide 2.5" front lift and 1.5" rear lift to both raise and level the stance of the FJ. There is no Metal-On-Metal contact so the polyurethane absorbs the noise, vibration, and harmonics that come from the suspension and avoids transmitting them to the passenger compartment. Maximum recommended tire size is 32" and it comes with a limited lifetime warranty. Also, the kit is of a top-mount easy-install design so no special tools are needed for installation. Front and rear spacers can be purchased separately. Kit Details: Fabtech offers 3 different 3" lift kits for the FJ. They include tubular upper control arms that feature 1.25” OD, .120” wall thick chromoly tube construction with 1” diameter Teflon lined uni-balls. The uni-ball UCAs can be purchased separately and can be used on stock applications or on 6" lifted applications. Kits also include Dirt Logic front coilovers and rear shocks, but no kit includes rear coils. Depending on the level of kit, the coilovers or rear shocks may have external reservoirs. Notes: It is suggested to use 33" tires with these kits. Body mount chop is suggested. Separate 07-09 and 10-14 kits. 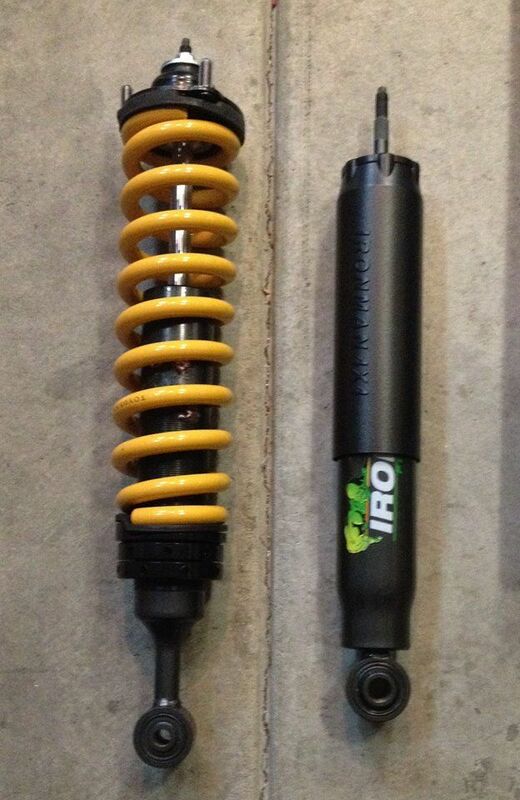 Front Dirt Logic coilovers have a 2.5" diameter and rear Dirt Logic shocks have a 2.25" diameter. Kit Details: Fabtech offers their 6" lift kits in either a Basic or Performance System, the difference being that the Basic Systems use long strut extensions so the factory front struts can be used while the Performance Systems come with varying degrees of adjustable Dirt Logic coilovers. 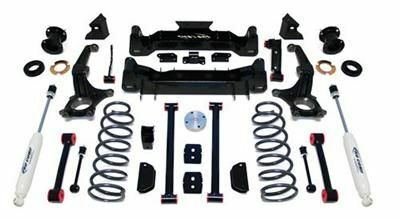 Kits include Heavy Duty 1/4″ Thick, High Arched Crossmember, Ductile Iron Steering Knuckles, Heavy Duty 1/4″ Thick Steel Skid Plate, Impact Struts, Sway Bar links, Rear Upper & Lower Link Arms, and Rear Coil Spring Spacers. The kits will include wither Fabtech performance shocks for the rear or Dirt Logic rear shocks depending on the level of the kit. The stock front and rear driveshafts are retained due to Fabtech's precise suspension geometry. Installation of this system will alter the center of gravity of the vehicle and may increase change of roll over as compared to stock as with all 6" lifts. Cutting and welding is required. Notes: Recommended for use with 35" tires, and trimming will be required. 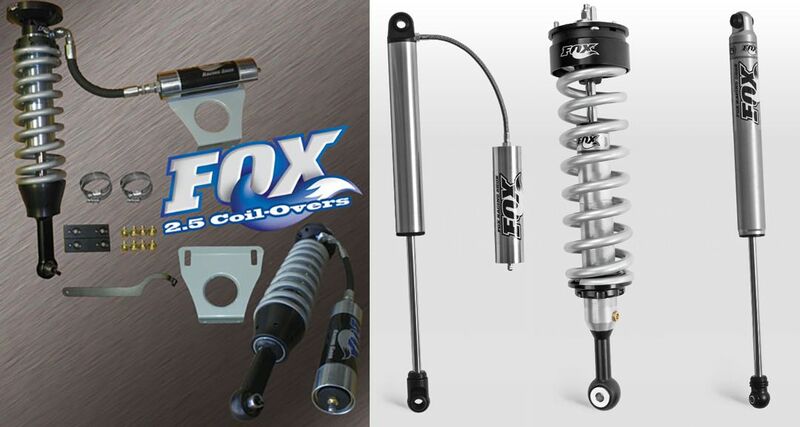 Details: FOX offers multiple shock and coil-over options for FJ Cruisers of all years. You can purchase their suspension specific for 07-09 models and 10-14 models. 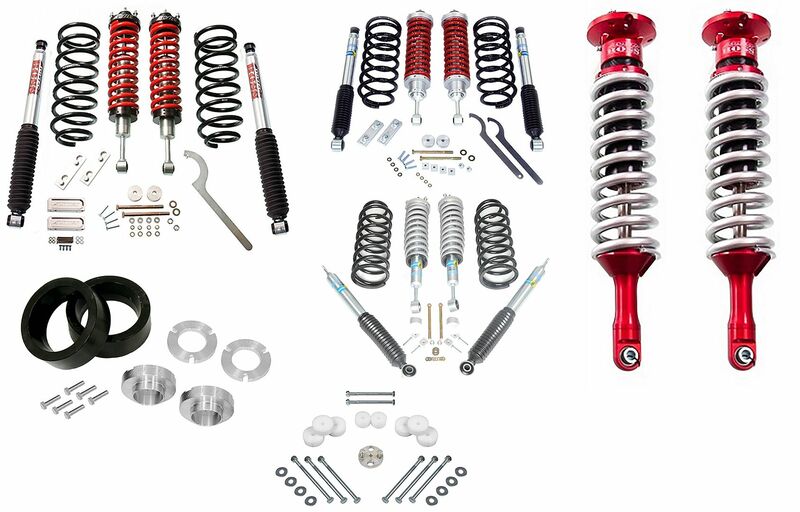 They offer both Factory and Performance Series coil-overs and shocks. The bodies of the factory style 2.5 coil-overs (which have a remote reservoir option) are a smooth-bore, clear coated, zinc plated, and honed seamless alloy with components made from black anodized billet aluminum with a shaft built from 7/8" hard chrome plated heat treated alloy steel. And then the performance series 2.0 coil-overs which do not have a reservoir option, are made from the same materials as the factory series coil-overs, but it has an aluminum shock body which dissipates heat three times faster than steel. All the coil-over options from FOX are adjustable from 1" of height to 3.5", making this a good option for both stock and lifted applications. Certain Factory Series coilovers require aftermarket upper control arms. FOX also offers multiple options for the rear suspension of FJ Cruisers. As with the front suspension options, there are Performance and Factory Series shocks. The Factory Series 2.0 shocks have a remote reservoir that is non adjustable and offers 0" - 1" of lift. Then the Performance Series has 2.0 ITP shocks which do not have a reservoir, but come in 0" - 1" lift versions for stock setups and 2" - 3" versions for lifted applications. Kit Details: Icon's products come in specific versions for 07-09 FJs and 10-14 FJs. They offer full kits in 7 different stages with the Stage 1 Kit including just the front 2.5" adjustable coilovers, rear 2.0" shocks, 2" lift rear coils, and front sway bar relocation blocks, to the Stage 7 Kit which includes external reservoir front coilovers with CDVC, 2.5 rear shocks with CDVC, 2" lift rear coils, front upper control arms and rear upper and lower links (in either a billet aluminum or tubular steel construction), a rear track bar, and the sway bar relocation kit. Recommended tire size of 33". Icon offers their front coil overs with or without external reservoirs and in either a standard travel or extended travel version. Notes: Previously known as Donahoe Racing, in 2008 the company was restructured and is now formally known as Icon Vehicle Dynamics. Aside from 3" lift kits, Icon also offers 5"-7" adjustable front coil-overs designed to be used with the Rough Country 6" lift kit. These shocks replace the supplied top load spacer/factory shock combination with a 2.5" Diameter Fine Tuned Race Style Coil-over. Icon also has rear piggy-back shock absorbers in a 2.5" diameter for the Rough Country 6" lift. Icon also offers products as part of their S2 Modular Performance Shock System which allows for a secondary shock to be added to your front Icon suspension setup. One of the nice things about the S2 system is there is no welding required, it is completely bolt on, and will provide further dampening and doesn't require aftermarket lower control arms. They do offer lower control arm skid plates as well and not only do they provide protection for the stock LCAs, but they also serve as the mounting point for the secondary shock that would go with the S2 modular shock system. It can be purchased as a kit in 3 different stages or as individual components. Icon also now has a rear hydraulic air bump stop system to reduce rear-end “kick” and to provide increased bottom-out resistance over stock. This kit installs inside the coil, and the bump-stops are fully rebuildable with the ability to be tuned for a custom ride. They also provide no loss in wheel travel. Another item Icon has is aluminium front sway bar relocation blocks for just under $40. Kit Details: Ironman 4x4 recognizes that there is no single solution practical for the varying needs of 4x4 owners and different driving conditions; therefore, Ironman 4x4 offers a wide selection of matched components. Nitro Gas Soft Ride shock absorbers are best used where comfort is preferred rather than firm control. The softer valving is best suited to light or no load applications. The Foam Cell shock absorbers provide a similar feel to the Nitro Gas shock absorbers, but these shock absorbers feature a larger piston and bore size to allow for more oil capacity which allows the shock absorber to operate cooler in rough offroad conditions or long haul corrugations. The newest Foam Cell Pro shocks are the most durable and robust design to date with the front coilovers developed to be fully adjustable coilovers similar to the BP-51 coilover from OME. Ironman 4x4 also sells a 20mm polyurethane spacer for the rear coils to compensate for added weight to the rear of an FJ. Notes: Metal Tech offers this kit with the Light Racing Upper Control Arms to further increase performance. Details: JBA is specifically an aftermarket Jeep product company but they do offer a few items for FJ Cruisers including upper control arms. They have a Standard (STD) and Heavy Duty (HD) Version of their ball joint UCAs and they both feature extended ball joint travel over OEM and even other aftermarket uniballs for a full 90 degrees of motion (40 degrees up and 50 degrees down). They are specifically designed for more articulation and especially for high caster. Their STD UCAs have tubing with 5/32" wall and that is 1" dia while their HD UCAs have a 3/16" wall and 1-5/16" diameter with 11 guage guests on the bushing bongs. They also offer their own JBA Total Control rear shocks and front JBA Adjust-A-Strut Total Control coilovers, but these aren't listed specifically for FJs, just Tacomas. Contact them to see if they work for FJ Cruisers as well. The UCAs have a one-year warranty. And they are also a dealer for Old Man Emu lift kits, shocks, and coils. Details: King, similar to Bilstein and Fox, doesn't sell their suspension parts on their own website but their products can be purchased through dealers, some of which are listed below. King Shocks has available for the FJ Cruiser front coil overs and rear shocks with a 2.5" diameter with external reservoirs. 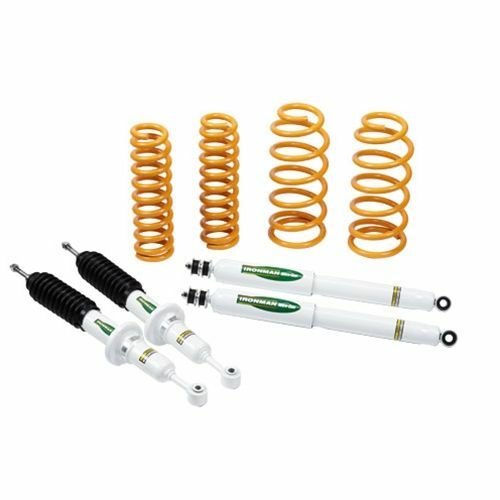 King coil overs and shocks do not come in a full kit since rear coils aren't also available from King. Their coilovers are adjustable from 0" to 2" of lift and King rear shocks can be used with up to 2" higher rear springs. Modifications may be required to install the front reservoir brackets in conjunction with sway bar spacers. 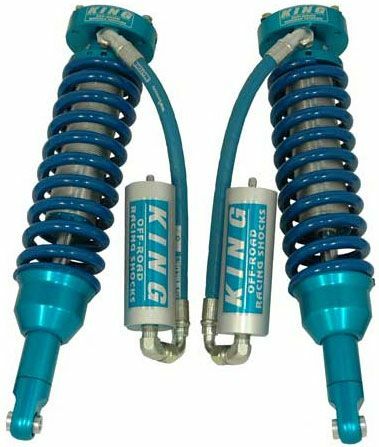 King also has available a front adjustable coilover for Pro Comp 4"-6" lifted applications, but these only work for 2010-current models. Notes: The new Right Front reservoir bracket does not work for 2010+ FJ Cruisers as reported by customers. ICChief, Lee44 and 101Firedog like this. Last edited by FJX2000; 10-29-2018 at 11:50 AM. re: The NEW Complete Lift Listing and Comparison, They're All Here! UPDATED! Kit Details: Solid CNC machined 6061-T6 Aluminum Spacers with pre-installed Grade 10.9 Metric studs, and flanged nuts with 14mm head like the factory to ensure that there will be no problems down the road. 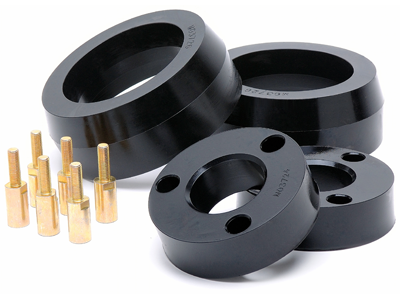 High grade Rear Polyurethane spacers Designed to provide a 1.5" lift from stock. Includes a differential drop to keep the Constant Velocity Joint boots from tearing, and to keep the CV Joints from premature wear from the increased angle. 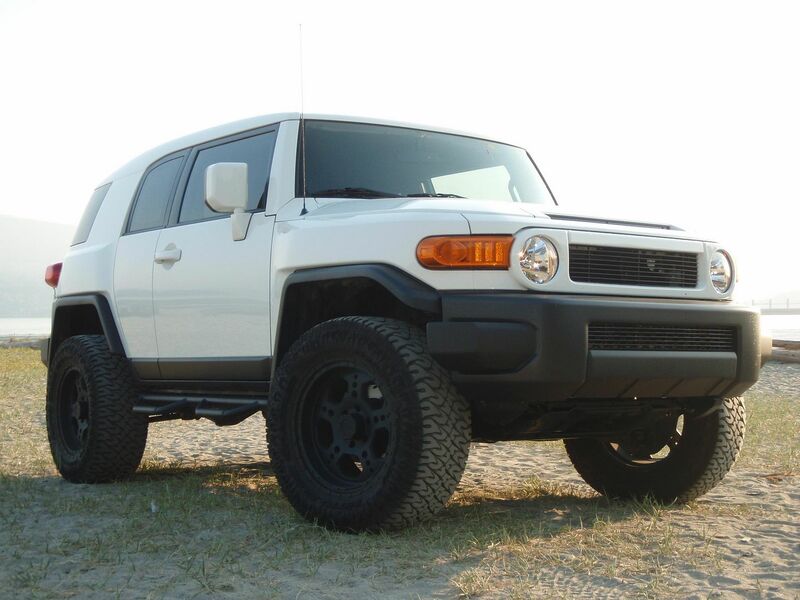 Applications include: 2003-2012 Toyota 4Runner, 2007-2012 Toyota FJ Cruiser. Low Range Off Road is also a dealer of other lift companies. Notes: Allows for up to a 33" tire with the factory wheels. This will not work on 03-09 4Runners Equipped with XREAS type suspension. This WILL work on 2010-2012 4Runners equipped with KDSS (Kinetic Dynamic Suspension System). Details: Though the options offered from MaxTrac aren't extensive they do offer an affordable "lift" (leveling kit - if you'd call it that) which only includes the front strut spacer made from steel and aluminum differential drop kit for 4WD models. The unique product offered from MaxTrac is their 2 Wheel Drive specific front spindles which are pretty beefy. They claim they are " 4" lifted " and made from solid iron and can be run with a stock suspension set up or with lifted applications. These allow for 33" tires to be run and there is apparently an increase in ground clearance, but again, this is only for 2WD FJs. Kit Details: Metal Tech 4x4 sells a range of suspension products from different companies (Icon, Ironman 4x4, Outpost Off road, Radflo, Total Chaos, Light Racing, Old Man Emu, Sway Away, TJM) but their personal claim to fame has been their very own rear long travel kit. This kit is offered in Stage 2 to Stage 5 variations. One can choose either 2" diameter long travel Radflo or Icon shocks for the kit or can upgrade to 2.5" diameter external reservoir Icon or Radflo long travel shocks. The rear coils on this kit come in "medium" or "heavy" spring rates depending on the weight in the rear end of the vehicle. All these kits include Metal Tech's 3" aluminum bump stop extensions and extended brake lines to allow for full suspension travel. The Stage 4 & 5 kits also include Metal Tech's lower rear links. What is neat is Metal Tech's unique progressive rate springs where the bottom half the coil is rated at 250lbs of spring rate and the upper portion is at 105lbs of spring rate, so with this combination the spring can stay in it's compressed position at ride height but expand out to it's full free height on down travel. These kits advertise a full 27.5" of wheel travel which is 7.5" more than an Old Man Emu setup. 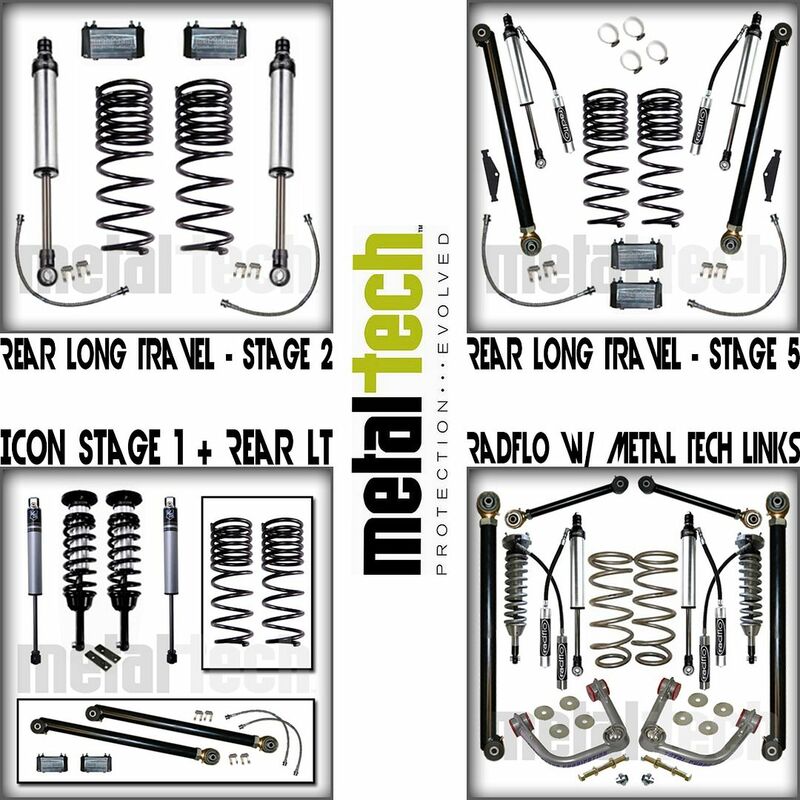 Metal Tech also offers for individual purchase rear upper and lower links, extended brake lines, rear bump stop extensions, a body mount chop kit, and their rear long travel coils. And another note is that some of the Icon full lift kits they offer come with the addition of Metal Tech's lower links or with their rear long travel kit. Some kits also swap out the Icon tubular UCAs or billet aluminum UCAs with Light Racing UCAs as to still maintain quality performance of the lift but reduce costs. Some of the Radflo kits offered also include Metal Tech's upper and lower rear links. Notes: Recommended tire size is 285/75R16, with a 16x8 wheel with 5" backspacing. Kit Details: Old Man Emu is ARB's suspension line and they describe their suspension as having a "Euro-sport feel with exceptionally responsive handling." They now have 2 styles of lifts, their older standard suspension lift kits include nitro-charged shocks for the front and rear shocks, and front and rear coils, all made in Australia. Depending on the vendor you can find these lift options in different styles including light, medium, and heavy configurations designed to handle different amounts of weight from stock FJs to heavily modded FJs (ie: bumpers, rood rack tents, gas tanks, etc.) And now OME has released their new line of BP-51 shocks (bypass 51mm is what BP-51 means). These are up to date, adjustable, external reservoir shocks and coils designed for durability and customization. Even the rear shocks are adjustable to give the driver their own desired "feel". These new suspension kits are only designed for 2010 and up FJs however. Details: Pro Comp's 3" lift kit does not have any adjustabilitly as with an adjustable coilover but it does include ES6000 front spring seat shocks for and ES9000 shocks for the rear suspension. Also included are coil springs for the front and rear as well as sway bar relocation brackets and other related hardware. Shock boots however are not included. Notes: Recommended maximum tire size is a 33x12.50, max wheel size is 17"+, wheel width range between 8"-9", and backspacing between 4" to 4.75". Details: Pro Comp's 6" lift comes in either a Stage 1 or Stage 2 variation. For the front suspension, the Stage 1 has a large spacer to be used with the factory struts while the Stage 2 kit uses Pro Comps MX2.75 coilovers. 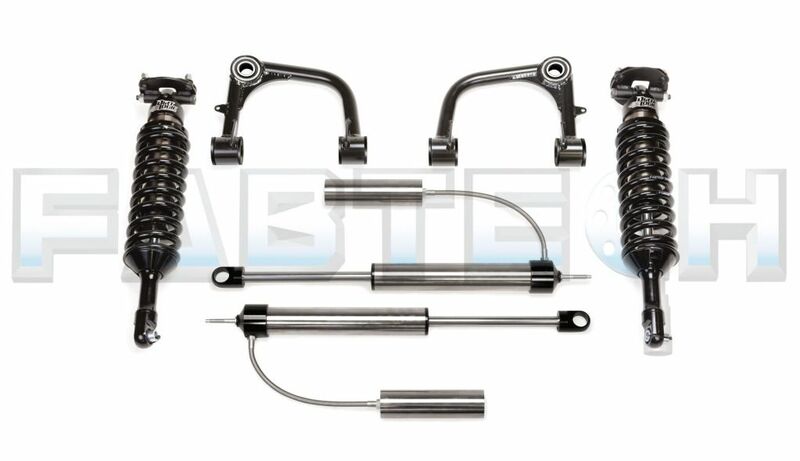 For the rear shocks of the Stage 1 kit, it has ES9000 Shocks while the Stage 2 has MX6 Adjustable Shocks. Other than those differences the kits are basically the same. 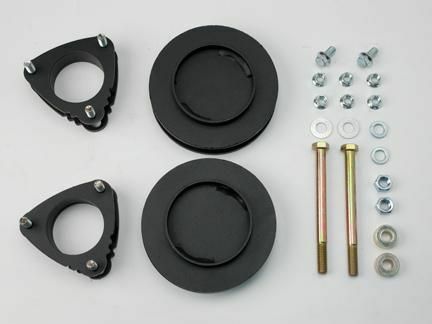 This kit does require cutting and welding to be installed. The individual Explorer Pro Comp Coil Over and rear MX-6 shock can be purchased as well for lifted applications. 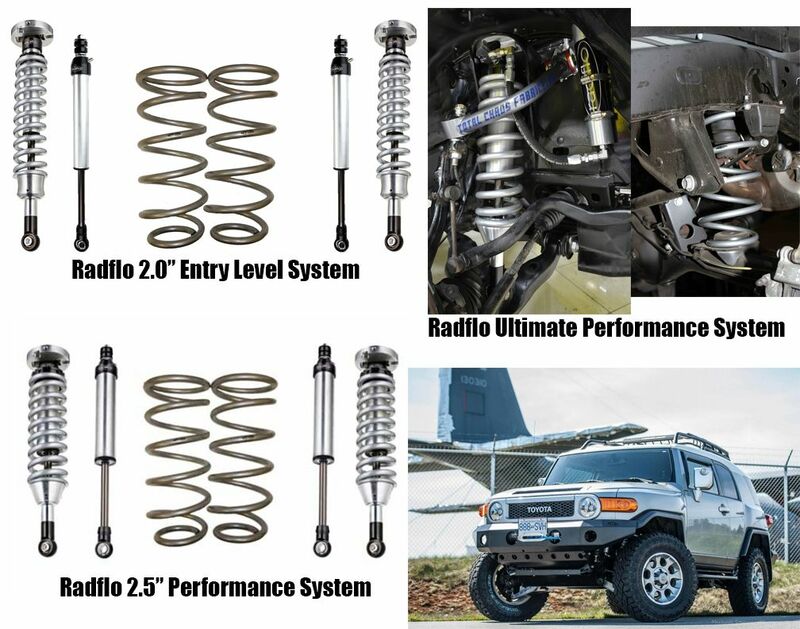 Details: Radflo offers many options as far as lift kits go, from entry level to ultimate performance systems. All their kits are adjustable for up to a 3" lift height and coilovers can be purchased as standard or extended travel versions, but the extended travel types cannot be used with the stock upper control arm and require aftermarket ones to be used. all their coilovers and rear shocks can also be purchased with or without external remote reservoirs. The 2.0" entry level kit includes 2.0″ diameter front coil-overs with sway-bar relocation brackets, 2.0″ dia. 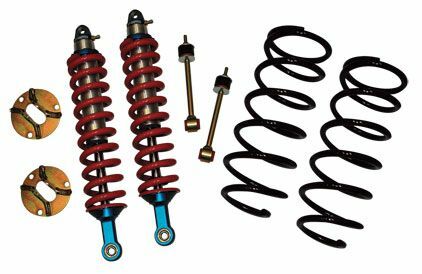 rear shocks with internal floating pistons, and 2.0″ lift rear coil springs. The next level kit is their 2.5" Performance Kit which has 2.5″ diameter front coilovers w/ sway-bar relocation brackets, 2.5″ dia. 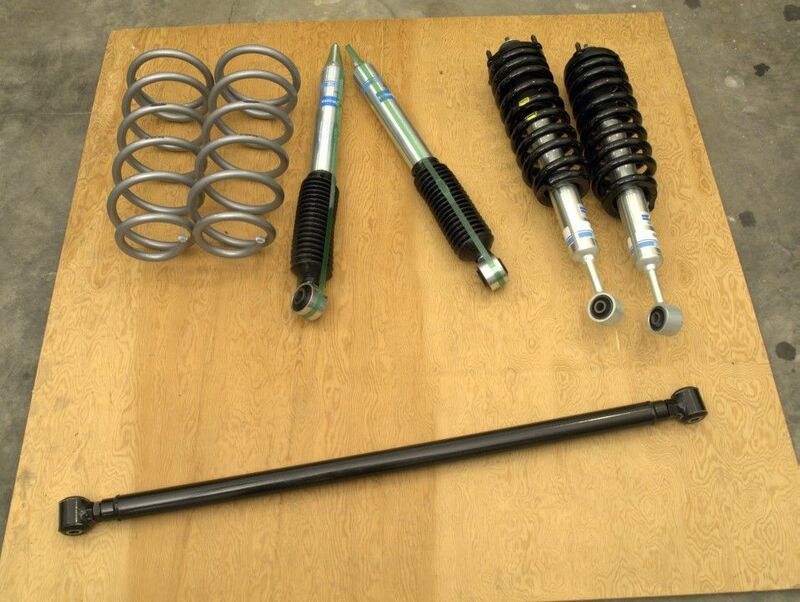 rear shocks, and 2.0″ lift rear coil springs. Then Radflo's final and highest performance option is their Ultimate Performance System with 2.5″ diameter front coilovers w/ remote reservoirs, compression adjusters and sway-bar relocation brackets, 2.5″ dia. rear shocks with remote reservoirs, and compression adjusters, and 2.0″ lift rear coil springs. With those compression adjusters, there are 26 different settings to allow the user to really "fine-tune" their suspension. All the kit's rear coils are advertised as offering 20% more spring rate for increased load carrying capacity and improved off road capability. You can also purchase individual 2.0" or 2.5" adjustable coil overs or rear shocks from Radflo with the same options offered in the kits. Notes: Recommended tire size for all Radflo lift kits is a 285/75R16. Radflo also not only offers the 3" lift options, but also offers 5"-7" front adjustable coil-overs and 6" rear shocks designed to work with the 6" lift from Rough Country. Options: Check on Metal Tech's website to find kit options in 6 stages similar to Icon lift kits and with additional items like upper control arms, rear upper links, and lower links. Details: Rancho offers multiple suspension options for the FJ Cruiser including 0" lift options and 2" lift options. 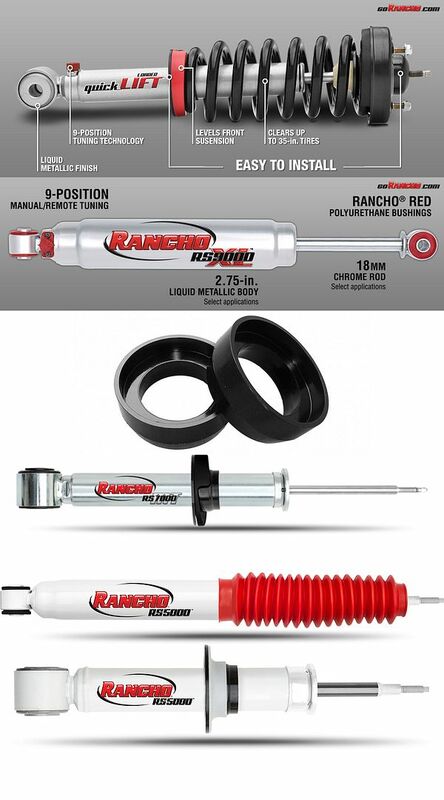 Rancho has coilover sets available for the front suspension, or they sell just the shocks for the front and the rear. The Rancho coilovers can be ordered in a 2" lift version and they have 9-position tuning technology allowing the user to manually adjust with a knob on the shock how much dampening they would like their ride to have. The coilovers level the front suspension and Rancho claims it can clear a 35” tire in select applications. They also have just the front shock available with the 9-position tuning technology and it is a 2.75" diameter body yet is the stock height. And Rancho has rear shocks for sale can be purchased in stock height or 2" lift versions, and when the rearcoil spring spacers are used one can achieve the 2" lift they desire. Almost all their shocks are compatible with the myRIDE wireless controller. This wireless controller lets the user select the dampening they would like on the vehicle in certain preset modes or in your own custom settings. 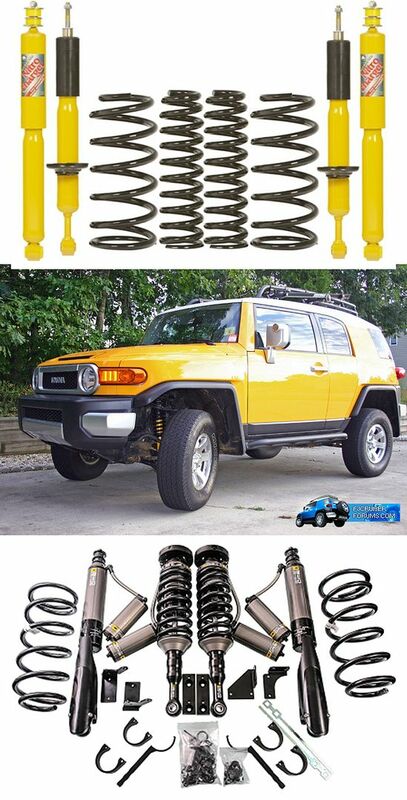 Kit Details: ReadyLIFT's lift kit works for Toyota FJ Cruisers & 4Runners. This spacer lift is designed to provide 3" of front suspension lift while retaining the OEM safe suspension geometry. 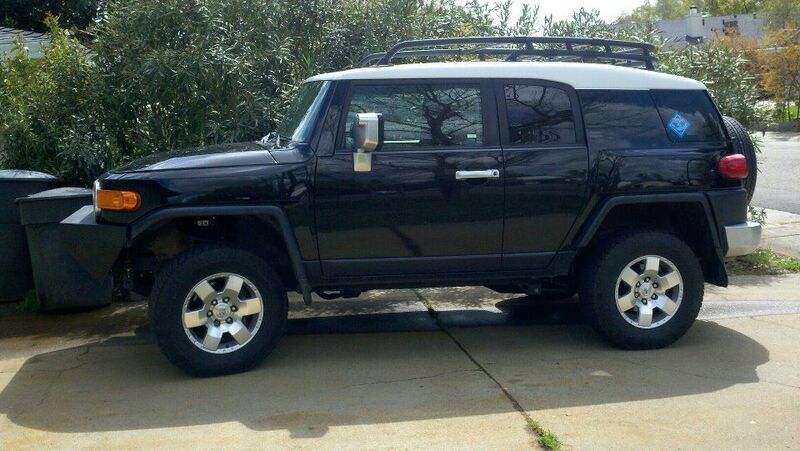 This system lifts the FJ Cruiser 3.0” in front and 2.0” in the rear, allowing for 33” tires to be run. ReadyLIFT also sells uni-ball upper control arms designed and made from stainless steel and are powder coated metallic grey. Kit Details: Revtek offers a 3" front/2" rear split-spacer lift kit and a 1.5" leveling kit for all FJ Cruisers, which are both designed to level the vehicle, but the lift kit actually increases ride height overall. But for 2010-2014 FJ Cruisers Revtek also offers just their front differential drop kit, the 3" front/2" rear lift kit without the rear shocks, and their NEW 3" front/2" rear front integrated anti-vibration technology Pro Kit. The new Pro Kit has built into the front strut spacer technology to reduce vibration from the road and increase the quality of the ride. 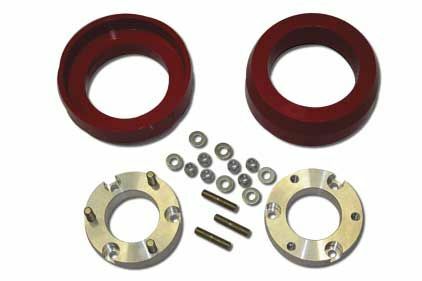 Revtek's rear spacers on any of their kits is made from "virtually indestructible" polyurethane and the whole kit is made in the USA. Fits up to a 285/75/R16 tire with a maximum recommended wheel width of 8" and with 4 1/2" backspacing. Kit Details: Rough Country now offers both 2" & 3" lift kits, the 2" kit consisting of front strut extensions and rear coil spacers which basically levels the vehicle. The next level up from this would be a similar 3" kit including aluminum front strut spacers, rear coil spacers, and Rough Country's Premuim N2.0 shock for the rear. Then the highest level 3" lift offered would be identical to the previous lift except the rear coil spacers would be replaced with rough Country's own lifted coil springs. All 2/3" kits are completely bolt on and unlike some polyurethane kits, this kit DOES NOT require dis-assembly of the strut, so no strut compressor required! Kit Details: Rough Country's 6" lift kit includes front & rear crossmembers, front raised knuckles, strut spacers, front upper/lower integrated skid plates, differential drop brackets, rear sway-bar links, rear upper control arms, rear trac bar, rear coil springs, bump stop drop brackets, and Performance 2.2 series shock absorbers for the rear. This kit requires no welding and is completely bolt on. Recommended tire size for this kit is a 35x12.50R17 tire. Notes: Icon Vehicle Dynamics and Radflo offer adjustable coil overs with or without external reservoirs which are designed specifically for this kit. They are adjustable to achieve lift between 5" and 7". Icon also offers rear 2.5" diameter piggy-back shocks for this kit for increased handling and performance. Radflo offers a 2.0" diameter shock without a reservoir for this lift. Check site for more details. Kit Details: Skyjacker offers many different products for FJ Cruisers, ranging from 2" leveling kits to 3" Performance Strut lift kits. The 2" leveling kit only provides a front aluminum strut spacer to level the ride, but they also offer a 2" front metal/1.25" rear polyurethane spacer lift. They also offer 1"-3" adjustable front performance struts (website not specific about this product and how it adjusts.) Then they offer their 3" performance lift kit in 4 different varieties with the only component that changes being the rear shocks. The 3" lift comes with the 3" lifted front struts, rear coil springs, rear sway bar end links, and then the rear shocks which can be selected as their M95 MONOTUBE 9500 shock, Black MAX 8500 shock, NITRO 8000 shock, or HYDRO 7000 shock (see website for specifics on each shock type.) Misc. 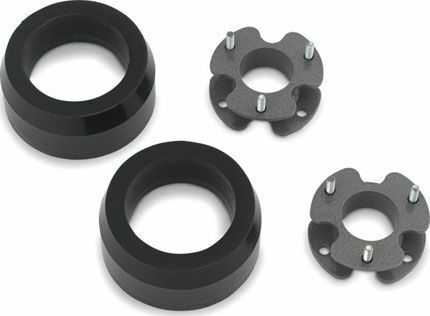 replacement bushings are also available for their products. 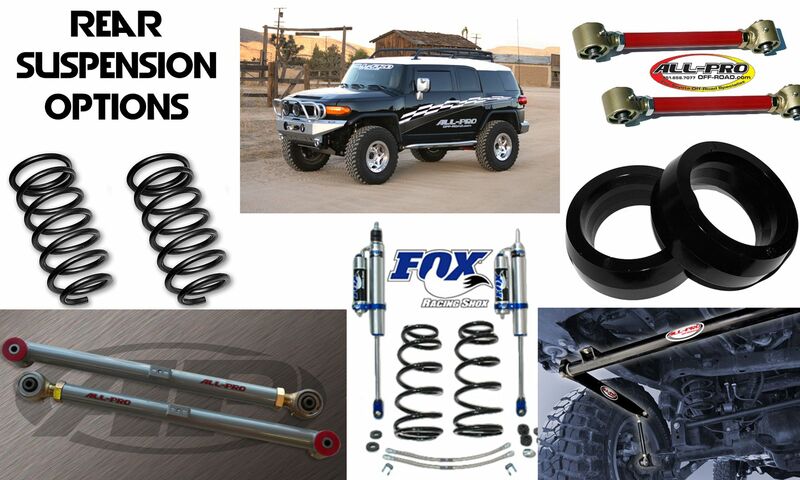 Type: Full suspension system with Bilstein non adjustable shocks or Radflo adjustable coilovers. Details: This kit basically takes parts from different manufacturers and companies and puts them all together to create their lift kit. All four shocks are Bilstein 5100 series designed for FJ Cruisers which they have further modified to hold the TRD coils they have paired up for the "ultimate combo." Front coil-over's are adjustable from 1/2" - 3.75" of lift. The rear springs are replaced with a custom made set matched to the rear shocks. The adjustable Trac Bar with free movement bushing ends unlocks the FJ Cruiser's real potential in the rear end and re-centers the axle under the truck after lifting. Overall lift is up to 3.75" for the front supporting a bumper/winch/skids and 2" in the rear. Constructed from 100% DOM Tube and very heavy duty. Sonoran Steel also offers Radflo 2.0 and 2.5 suspension kits that include the front adjustable coil-overs (with or without reservoirs), Radflo custom wound 2" lift rear coils, rear Radflo shocks (with or without reservoirs), and Sonoran Steel's adjustable Trac/PanHard/Lateral Bar. Details: The company aFe Power/Control recently acquired the Sway-A-Way line of high performance replacement adjustable coilovers and shocks for Toyota vehicles. The parts are all still designed and built in the USA. The products offered now from aFe Control include the Sway-A-Way 2.0" front adjustable coilovers (2" shock diameter), Sway-A-Way 2.5" front adjustable coilovers (2.5" shock diameter), Sway-A-Way 2.0" rear shocks (2" diameter shock), and Sway-A-Way rear coil springs. The front coilovers are designed to accommodate 2-3" lifts and the rear shocks and coils are set to achieve 1-2" of rear lift. Last edited by FJX2000; 10-29-2018 at 09:39 PM. Long Travel Details: Total Chaos offers several different long travel kits along with other suspension parts. They offer both +2" and +3.5" long travel kits, and those numbers are how much wider the kit makes your track width on each side. So the +2" kit makes your FJ's total track width 4" wider and the +3.5" kit makes it 7" wider. These bolt on systems are intended to install a pair of 8” travel 2.5” diameter coilovers from Sway-A-Way, Fox, King, or Icon that bolt into the factory coil bucket locations. 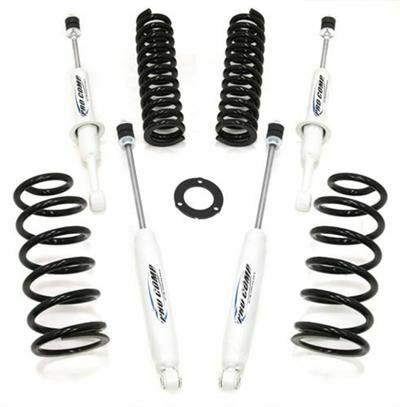 This kit cannot be installed with standard 3” lift coil over shocks. Their UCAs are made from 4130 chromoly. To run the Total Chaos LT kits, running their extended axles to retain 4WD is necessary. Their LT lower control arms are already tabbed for dual shock compatibility. Also, Total Chaos upper control arms are available with an optional 3/4" chromoly lined heim joint as opposed to the standard 1" uniball. Other Details: Total Chaos also offers many additional suspension goodies. They offer UCAs that are designed for your standard 2.5"-3" lifts and offer and additional inch of travel when used with extended length coil over shocks. They also offer UCAs with 3/4" chromoly heim joints for the pivots but these were specifically designed for use with 6" lift kits. They also offer bolt-on rear bump stop kits designed to work with King or Fox 2.0" diameter bump stops. Other suspension components such as weld on spindle gussets are designed to add strength to the stock spindle, and they offer a complete spindle that adds 3.5" of lift for 2WD models, but that can only be used with Total Chaos' balljoint or uniball lower control arms. They also have full sets of chromoly adjustable rear links, aluminum skid plates for factory and TC lower control arms, and complete bushing kits available in different materials such as urethane and nylatron. Other products that Total Chaos offers include their stock length lower control arms. One design is their standard uniball type LCA with an integrated 1/4" thick steel skid plate and the other design is their Race Series Chromoly Boxed Lowers. Both of the designs they offer have dual shock compatibility and the boxed lowers have an integrated uniball joint and they offer more ground clearance. Total Chaos also has their dual shock hoops which require to be both bolting and a small amount of welding and work for their stock length control arms or long travel arms. Notes: A maximum tire size of either 285/75R16 or 285/70R17 is recommended. With +2" kit, fiberglass fenders are not needed but with +3.5" kit, they are required. Disclaimer: Long-travel set-ups typically cost almost double the cost of the kit itself once all the extra components ( long travel coil overs, extended axles, etc.) are purchased and fabrication is completed (welding on of spindle gussets, limiting straps, body mount chops, bump stops, etc.) Installation will also add to the cost which could easily be an additional $500-1500 depending on work completed, gusseting, and replacement of parts as found worn. Kit details: ToyTec offers both complete 3" lift kits and individual suspension components. They have a 1" body lift available and other options like sway bar re-locators and a diff drop kit. They also offer 2.5" & 3" leveling kits. The spacers can be bought in just an aluminium finish or they can be anodized black, blue, or red. ToyTec's main lift kit was their Ultimate 3" Lift Package featuring adjustable Bilstein/ToyTec coilovers but now they have their own BOSS Suspension System featuring their own 2.0" diameter BOSS adjustable coilovers and rear shocks. And they also have their newer BOSS Performance Suspension System with 2.5" diameter BOSS adjustable coilovers with or without an external reservoir and 2.0" diameter rear shocks also with an optional external reservoir. (A 2.5" diameter rear shock is also an option with either BOSS system and an HD (Heavy Duty) version of their Superflex rear coils is an option.) Diff drops are usually included with their kits. ToyTec also offers King, OME, Icon, Bilstein, and Total Chaos suspension kits/components. They also offer their own line of aluminum rear links to strengthen the rear suspension, and they offer many additional other products. Kit Details: Just recently, Trail Master as updated their selection of lift options and now offers a 3" Leveling Kit complete with 3" front strut spacers, 2" rear coil spacers, diff and skid plate spacers, and with or without NGS Shocks. The recommended tire size for the 3" kit is 33x12.50 tires and it has a lifetime warranty. But now also available from Trail Master is a 6" lift kit complete with 6" front strut spacers, 4" rear coil springs, knuckles, heavy duty crossmembers, rear upper control arms/links, rear NGS shocks, and other necessary components. The recommended tire size for their 6" lift is 35x12.50 tires with 18" wheels or larger. Kit Details: Spacer lift parts available. Front strut spacers in either 2" or 3" variations and rear spacers that are 1.25". They also offer a diff drop kit and a full lift kit including front & rear spacers and the diff drop. The full kit also has optional plates for an additional 1/2" of lift for the front end suspension for an extra $30. Kit Details: The TRUXXX 905090 3" lift kit provides a 3” lift in the front and 1.25” lift in the rear to level the FJ. Truxxx states the kit enhances the ride of your vehicle as well as increasing the ground clearance and providing room for larger wheel and tires. Made in the USA with USA Mill Certified Steel and laser cut to precision tolerances using OEM drawings. Kit includes two front strut spacers, a front differential drop, two rear spring spacers and all the hardware needed. Notes: Recommends a 33" tire and estimated install time to be about 2 hours. 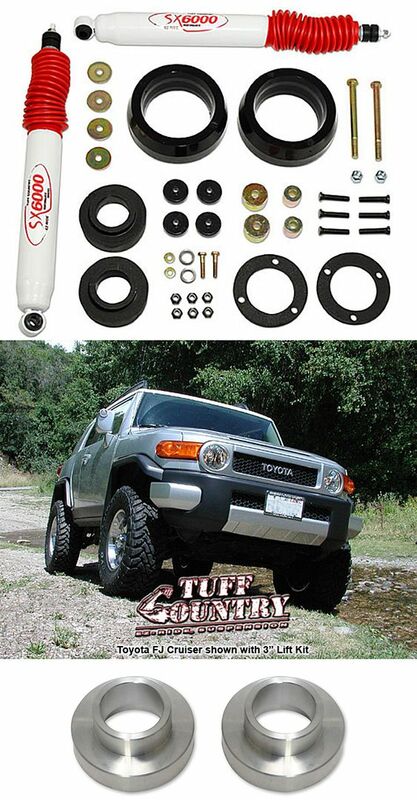 Kit Details: Tuff Country offers a couple different FJ Cruiser options. First they have a simple leveling kit which includes front aluminum spacers, thus leveling the FJ. 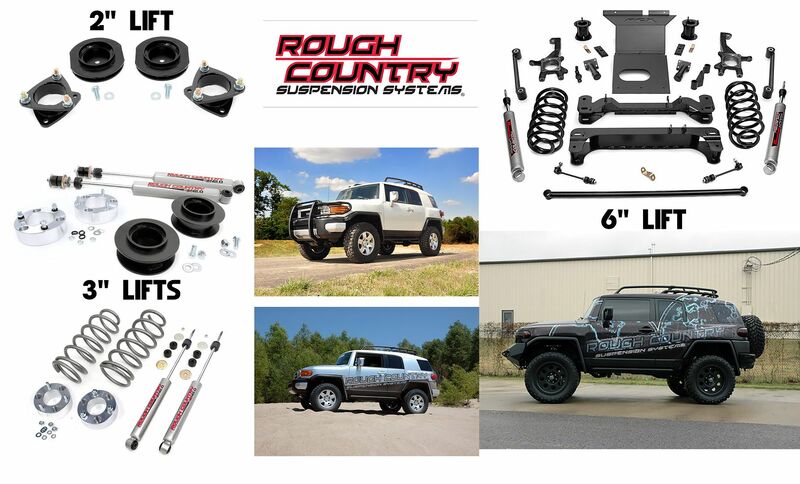 Tuff Country also offers their EZ-Ride Suspension lift kit which includes upper strut spacers (like the leveling kit), a differential drop, and rear coil spacer rings. They recommend a 295/70 tire with this kit. But important to note is that the shocks shown are actually sold separately and they offer either their SX6000 Shocks (Hydraulic) or SX8000 Shocks (Gas). Completely bolt on. Details: Warrior Products web site says that its kits are built to stringent standards for strength, performance and durability. Two of the three systems offered by Warrior Products come with H60.5mm shocks, featuring a nine-stage valve system, and a self-lubricating polished chrome piston. 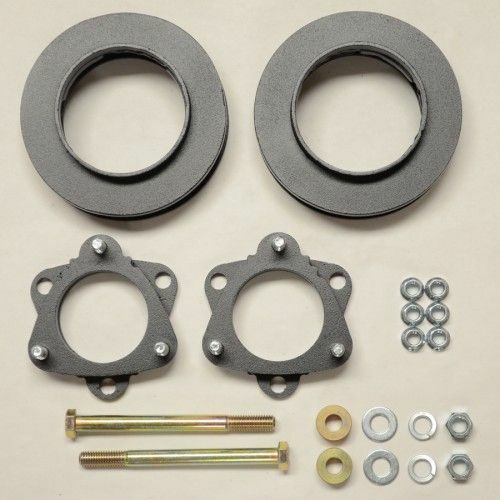 These kits utilize spring spacers to lift the vehicle 3″ in the front and 2″ in the rear. Each kit comes with the necessary hardware required for installation. The first system offered (the Stage I Lift Kit) simply has only the front and rear spacers. The second system (the Stage I Lift Kit w/ Shocks) has the same hardware as the first system, but with the rear shocks included. And then the third system available (the Stage II Lift Kit w/ Shocks) has the same hardware as the second system, but with a differential drop, so reduce ware on the CV boots and other suspension/steering components. Keep in mind, next to company names it will list if they are an FJCruiserForums.com Supporting Vendor. 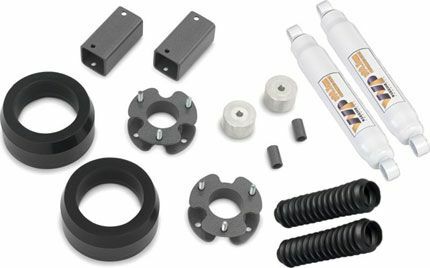 LONG TRAVEL DISCLAIMER: Disclaimer: Long-travel set-ups typically cost almost double the cost of the kit itself once all the extra components ( long travel coil overs, extended axles, etc.) are purchased and fabrication is completed (welding on of spindle gussets, limiting straps, body mount chops, bump stops, etc.) Installation will also add to the cost which could easily be an additional $500-1500 depending on work completed, gusseting, and replacement of parts as found worn. Last edited by FJX2000; 09-08-2017 at 08:30 AM. All of those top plate bolt on spacer lifts should have a disclaimer next to them, stating "this product lengthens your front shock beyond the reach of the front bump stop, blown out front shocks will occur with common off road use, shock stems may fail in extreme situations, upper control arm ball joints will contact springs in extreme situations. Torn CV boots or broken CV joints may occur if used in conjunction with after market front upper control arms." Last edited by FJX2000; 10-30-2016 at 09:50 AM. Reason: So photos in this post don't become confusing to people viewing the actual comparison. If there are any lifts out there that I forgot or that you would like me to add, I would be more than happy to make revisions to the list. And if there is incorrect information or just info that you think i should add, feel free to let me know. Already LT. the Metal Tech supporting vendor and site sponsor messaged me requesting that I add their rear long travel kit so I made sure to make a nice, big section for Metal Tech since even though there were links to their site for where you can buy certain lifts, I completely forgot about them as a vendor who sold their own kits! So if any other vendors out there want anything added, PM me and I'll be right on it. Hope you enjoy the thread and that the information is helpful!!! Scootin_Houten, ThinBloodFJ, Bruce Fulton and 1 others like this. If you have any vehicular problems that may result in potential safety issues in the long run that Toyota's simply putting a Band - Aid® on or ignoring outright (be it Premature Throwout Bearing Wear, Weak Fenders, Vibrating Steering Columns, etc. ), make the issue known and report it to the NHTSA through the link below. I have already done my suspension but want to tell you thanks for all the work you went through to put this together. That was a lot of work but you really helped anybody thinking about an upgrade. Great effort and the results are there. tlpd107 and Bruce Fulton like this. Great update. Just noticed the link for King's takes you to Fox. Opps! Thanks for letting me know! I'll fix that!